An Edmonton ski team that escaped a huge fire at Panorama Mountain Village ski resort in B.C. on Wednesday has lost all its equipment. 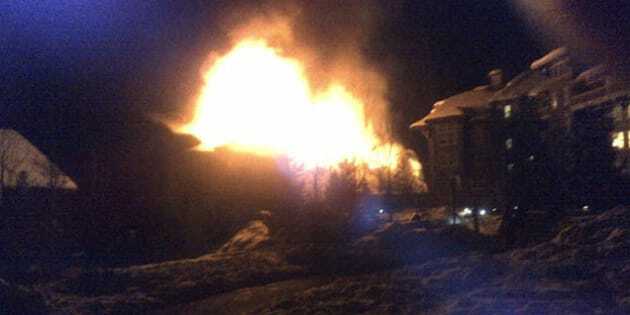 According to the CBC, the team was staying in the 1000 Peaks Lodge, where the fire broke out early Wednesday morning. They are at Panorama to participate in Thursday's U16 Can-Am Western Championship ski races. The top floor of the five-floor lodge was gutted by the flames, but everyone staying in the building escaped unharmed. "We managed too keep it to the top floor only, without it spreading to other buildings or down further," Fire Chief Jim Miller told the CBC. Alberta Alpine president Adam Hull told the Calgary Herald some of the racers have decided to return home and regroup, while others have chosen to borrow equipment from other teams in order to continue with the competition. East Kootenay News is reporting that 27 firefighters from the Invermere, Windermere and Panorama fire departments worked to contain the blaze. Miller told East Kootenay News that 10-12 units in the condo building were lost to fire and many others sustained heavy water damage. It will cost millions of dollars to repair, he said. “This is a large building and this could have become a much larger fire if it weren’t for the swift response and hard work of the firefighters on scene,” he said.